ARISE is a well established name in market for its excellent legacy of offering world class lighting products. ARISE got established in the year 2008 as a PVT. LTD. Company business concern in world fame Indian city ROORKEE, UTTRAKHAND. Under the guidance of Mr. VIRENDRA THAKUR (Director/Sales & Marketing) and Mr. Amit Chauhan (Technical Engg. ), our company is scaling new heights of success year per year. We are a well acclaimed name in market for manufacturing, supplying and exporting of wide variety of lighting products which include LED Street Light, Solar Charge Controller and many more items cherished for their designs and many other features. We also provide installation service of all the given products. The entire range of products receives huge admiration for their high performance, flawless finish, reasonable price and many more qualities. In addition to that we are well known in market for our keenness in customizing the range into different sizes and designs as per the wish of clients. Our appointed engineers possess inherent skills in offering a range which receives massive appreciation from all corners. Our company is enlisted as the renowned provider of an exceptional quality array of ARISE Mobile Solar Light Tower to our valuable clients. These Mobile Solar Light Towers are made at our advanced manufacturing unit using high grade raw material and innovative technology as per the requirements of clients. 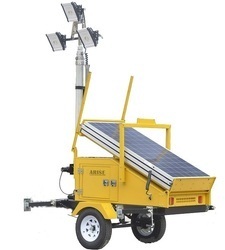 These ARISE Mobile Solar Light Towers have long life span and are excellent in performance. 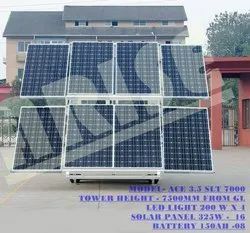 Looking for SOLAR MOBILE LIGHT TOWER ?